A 19-year-old hiker survived after being stranded overnight in subzero temperatures on "extremely precarious” ledge 13,000 feet up in the Rocky Mountains, rescuers said. Samuel Frappier, from Quebec, Canada was descending from the summit of Longs Peak in Colorado when he became stranded on Tuesday afternoon, the Rocky Mountain National Park said in a release. He was finally taken from the mountainside after what the release called a “significant technical rescue” that included assistance from a helicopter. Frappier was in contact with rescuers via his cellphone. He and a friend were ascending Longs Peak, a 14,249-foot peak, from the western side of Chasm Lake via Lambs Slide when they became separated. Frappier reportedly had no technical experience in climbing or mountaineering and was dressed in cotton clothes and sneakers. 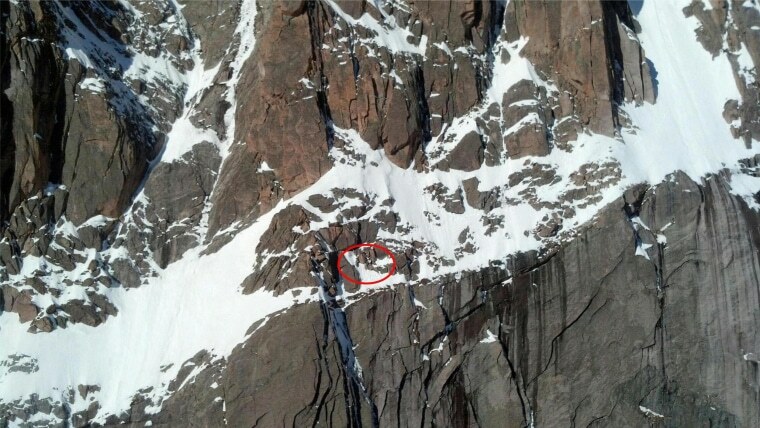 In total, 28 rescuers were involved in the operation, NBC News’ Colorado affiliate 9News.com reported. The team faces hazards including active ice and rock fall. He was taken by ambulance to Estes Park Medical Center for evaluation after being rescued at about 6 p.m. Wednesday, the Denver Post reported.